Posted by wmmbb in Africa. The violence in Kenya is at first sight a puzzle. At a closer look it does not seem to be effervescent violence but due to organized gangs who we are told in some reports are paid and able to sustain random (or is it systematic) violence. The role of the police, following the election, was always questionable, based alone on the rhetoric and methods used against what seemed at first to be protests who were characterized as thugs. Now it seems as the level of violence has increased, the military has been employed. ABC News Online reports that police helicopter gunships have been used. Posted by wmmbb in Israel-Palestine, Modern History. The diaspora of the Palestinian people has taken them to many places, including Brooklyn, and then Staten Island, New York. Place exerts its strange chemistry on the expression of people in voice and style. Suheir Hammad was born a Palestinian – you know the people locked up like animals in Gaza, and denied basic essentials by the Jewish State, by people who seem to have forgotten that part of their history when they too were “the other”. The inhabitants of Gaza – and Zaire and all the other man-made hell holes – are people too. Posted by wmmbb in Modern History, Social Environment. Such was the collapse of the Roman Empire in the West, although it too was denied by people living over a period of four or five hundred years, or however long it took, that new institutions had to be invented to retain what they could of the knowledge of the past, and to meet new social needs. The remarkable thing is that many of the medieval institutions have transcended modernity. There are many examples such as parliament, universities, surnames. Chalmers Johnson wraps it up on this video by saying, “That is the way that empires end, it is a suicide pact”. Through numerous interviews he has his case pared down to the essentials. The details is in his books and articles. Long story short: The wall is fast approaching and something, probably the US economy has to give. America, he says is going bankrupt. My knowledge of popular culture is not contemporary, although I would have thought that by now the so-called “goths” would have passed out of fashion. Whatever they are, or aspire to be, they apparently have nothing to do with the Visigoths or Ostrogoths. Now it seems that a couple in Dewsbury, Yorkshire are claiming discrimination according to BBC News. It seems that they were thrown off a bus because the young man had the young women on a dog lead, and it was claimed to be dangerous. In the related video the young women claims that “I quite like it”. Now despite appearances to the contrary, perhaps they are working hard to be weird, and that is the point, much like the woman at Berkley who went around blowing soap bubbles from a pipe and reciting poetry, and who made a similar comment. I did not know that when William McKell, former premier and boilermaker, was appointed Governor-General, the esteemed Robert Gordon Menzies called it “humiliating”. After all the Governor-General was originally the representative of the Imperial Government in London and notionally the Vice Regal. It is a odd thing that through our other great national symbol, the blue ensign with southern cross and federation star, Australia is so tied to the deeply lamented (not) empire of yester-century. On 4 April 1967, Martin Luther King delivered a speech at the Riverside Church, New York in which he said among other things that the US was “the greatest purveyor of violence in the world today”. The speech was entitled, “Beyond Vietnam – A time to break the silence”. The mainstream media turned on him, and as I understand it have drawn down the cone of silence since that time. At Time Magazine the speech was described as “a demagogic slander that sounded like a script for Radio Hanoi.” The Washington Post commented “King has diminished his usefulness to his cause, his country, his people.” They were prescient. To the day and one year later MLK was assassinated. I can go to the fridge, for that is where these things are posted in our house, and still find the leaflet, “Stop the War on Iraq – No Australian Involvement”. In the bottom left hand corner it says: “If war starts – rally the day after 5.30pm Wollongong Mall”. As it turned out we did not make those rallies but we did join the main rally at Wollongong Mall, or rather I went along as a spectator and listened to the speeches, from among others as I recall, a Catholic Bishop. That was in 2003, and similar demonstrations occurred around the world, and to no effect. The reign of murder and misery was launched regardless, and our presence there averted none of it. So to this day we must carry the burden our failure. James Reston argues that energy, special interests, climate change, terrorism, health care and immigration will not be the defining issues of a new era since they have been subject to what passes for political discussion since the 1990s’. I do not agree. In my opinion, and it will be of great interest what the American voters decide, that these are issues for a new dispensation, a new spirit and style of government. I know this is of no importance to anybody, except me, but I can actually read stuff now, like books and newspapers. It is amazing. Last week I finally went and had my eyes tested, which involved more health checks than I expected. For example, glaucoma and muscular degeneration as it applies to the eye, were checked out. Yesterday, I stopped by and had the new lenses fitted to my existing frames. I will leave the other orders of consciousness to the mystics, I am fully delighted with objective, scientific reality, albeit limited by understanding, and in turn in the knowledge that understanding limits perception. Perception is cognitive. Still you cannot read if you cannot see the letters and words on the page to read. Of course, even with print, I can only decode what is, or becomes, meaningful to me. Sometimes the beat-ups ignore the salient facts. The recent reports of the argy bargy in the Straits of Hormuz between American warships and Iranian speed boats failed to report that there are no international waters in the Straits of Hormuz. This fact was at least point out by Kaveh L Afrasiabi, writing in Asia Times. (via The War in Context). Posted by wmmbb in East Asia, South Asia. As we know China and India share a common border, which has been a source of military conflict. They have a joint influence on the countries to our North, along with Islam. (Islamic influence may have been greater in India, but are significant in the eastern China, spurring separatist aspirations seen often now as terrorist movements.) Of course, now both countries as well as be populous are significant global economic players, and so that improvement in trade and economic relations between them will seen as important developments. هلو تو أل مي أربك سبيكنغ فريندس. مي وبنم إز ومب اند مي بلغ ستس ار كلد دكبند.ذيس انفورماسيون إز ردندنت، سينس يو ار حر أنيوي. ترنسمسين ول رسمي إن لتين ألفبتك لتس اند أربك نمبرلس.بيس اند بست وشاس. The previous video of this track is no longer available, for unknown reasons. No problem, let’s just repost another version of the same song and see how long it lasts. Posted by wmmbb in Iraq, Middle East, US Politics. G Bush, President of the greatest nation on earth and in human history, blah, blah, is sharing with us his perspective from bubbleland, or is it fantasyland? Firstly, he said that he would create peace between Palestinians and Israelis. If he said he was to sow discord, murder and mayhem, which would be consistent with his record, I would believe him. Now he is saying, that such has been the success of the temporary escalation of US Forces combined with ethnic cleansing and walling of communities in Baghdad and Iraq, that hope has been restored to Iraq. Apparently not only is G Bush patently stupid, or given wholly to wishful thinking, but he has no concept of taking responsibility for his decisions. 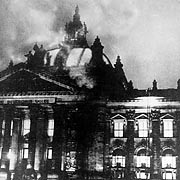 The Reichstag fire on 27 February 1933 was a critical turning point in the rise of Hitler and National Socialism in Germany. It achieved more for the Nazis than they were ever able to achieve at the ballot box. While the unemployed Dutch bricklayer was found inside the building was summarily executed for purportedly lighting the fire. Posted by wmmbb in South East Asia. Now more than forty years later it has been revealed that the Gulf of Tonkin incident that resulted in a massive escalation of US forces in Vietnam was a hoax. The report by the National Security Agency provided by a mandatory declassification request to the Federation of American Scientists says that officials lied about the incident. I will give you Iowa, the caucusing system there seems extraordinary as it is participative. By contrast New Hampshire seems to me a return to stupid land. It seems that people make their decisions on the basis of what they have been conditioned to think by television, run in turn by a few major corporations. So addictive is the drug that apparently the expression in the “hood” is that hope does not pay the cable. The icecaps continue to melt. As The New York Times reports they represent huge sources of water, enough on the current trend to raise the sea level in this century by two feet – some will get their toes wet. One question might then be, since the process seems now to be irreversible, is how do we as human beings purpose to change: do we weigh for the full implications, or do we anticipate and forestall the worst case outcomes, or do we believe, as some have proposed that since it will affect others, it does not matter?